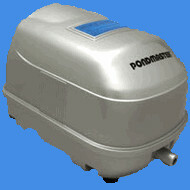 MODEL AP-40 FOR PONDS UP TO 5,000 GALLONS. • 1 Year AP-Series air pumps operate on standard 110V electric and come with 6’ power cords. barbed outlets to optionally connect 1/4" ID tubing, (1) rubber coupler, (2) clamps and instructions.